The Eastwick Neighborhood of Philadelphia is the southernmost neighborhood in the city and includes several of the last remaining undeveloped sites within city limits. 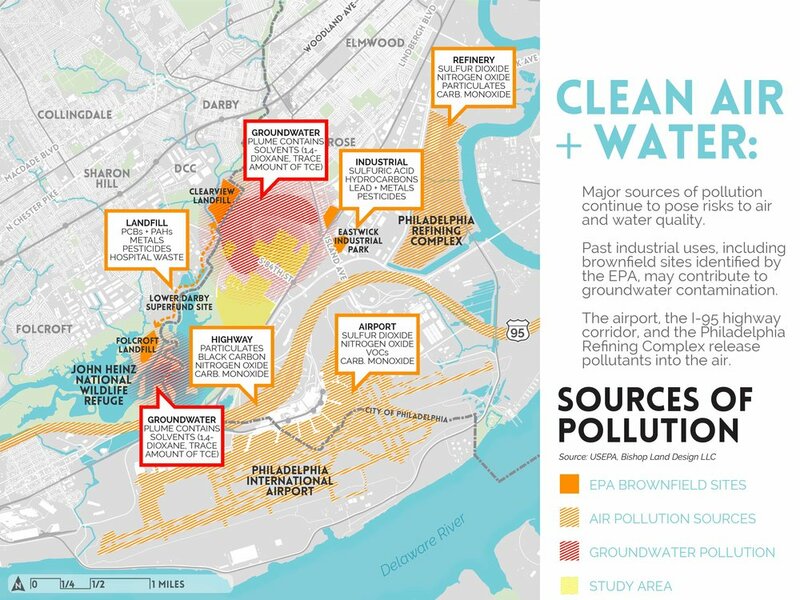 Situated near a series of landfills, industrial sites, and the Philadelphia International Airport, the Lower Eastwick study area falls within a challenging zone plagued by air pollution and industrial contaminants above and below ground. Flooding from local tributaries to the Schuylkill and Delaware Rivers, along with a high groundwater table, has resulted in sites that are precipitously vulnerable to seasonal flooding and storm surges. Addressing these concerns through green infrastructure approaches, a series of strategies has been developed that will redirect stormwater overflows to protect vulnerable sites, utilizing open land and above-grade channels where possible to convey water. These sites have the potential to become prime recreational and community resources, as well as providing improved environs for new development. Working with an interdisciplinary team led by Interface Studio, the overall plan includes the identification of strategic development sites, proposals for integrated infrastructural systems, and prioritization of remediative and high functioning ecological sites.